Well ,it is official, fall is here! Gone are the sweltering days of summer and in its place the cool, crisp fall air. The fall weather offers the perfect excuse to cuddle up inside with some warm blankets and great food. But if you are looking to add a bit of flair to your fall cuisine try some of these cannabis friendly recipes. An alternative spin on the standard comfort food, mash potatoes, this recipe combines the richness and sweetness of sweet potatoes with the delectable taste of cannabutter. Simply preheat your oven to 350º and combine all the ingredients below into a large mixing bowl. After mashing and mixing the ingredients pour the mixture into a 13 x9 casserole dish and bake for 45 minute. *Pro Tip- Add more cannabutter when done for extra potency. The quintessential comfort food, this Mac & Cheese recipe is sure to become a crowd favorite. Start by preheating your oven to 375º. Boil ½ pound of elbow macaroni in a large pot and then drain well. The in a small saucepan melt 5 tablespoons cannabutter . Next, add ½ cup all-purpose flour and whisk it for 5 minutes. Then add 2½ to 3 cups of saucepan melt 5 tablespoons cannabutter . Next add ½ cup all-purpose flour and whisk it for 5 minutes. Then add 2½ to 3 cups of warmed milk and let it cook for 1 to 2 more minutes. While the mixture is cooking combine 1 tablespoon canola oil and 1 cup of breadcrumbs into a small bowl. Then add the following ingredients to the sauce: 4 ounces smoked mozzarella, 8 ounces medium cheddar, 1 teaspoon smoked paprika, ½ teaspoon freshly ground black pepper, ½ teaspoon ground nutmeg. Next add the cooked macaroni and stir well. Finally pour the completed mixture into a casserole dish and bake for 25-35 minutes (or until the sauces is bubbly). 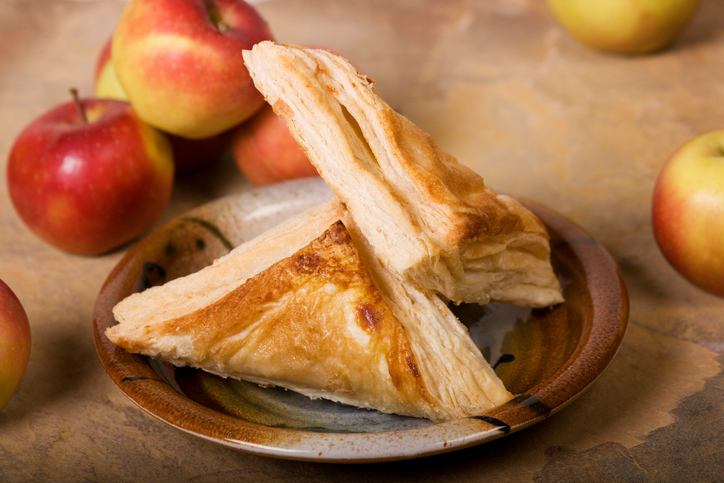 Nothing says fall quite like a hot apple turnover. This delightful concoction takes this fall staple to a new level. It is important to note that this recipe is a two-parter. We will start by giving you the recipe for the turnovers themselves. Combine the following ingredients into a large bowl and stir until evenly mixed. Combine all the following ingredients in a heavy four-quart saucepan and cook over a medium heat for 15 to 20 minutes( until the butter melts and the mixture comes to a boil). Then using either a store-bought pie crust or homemade, roll out the crust and cut into 4 to 5-inch squares. Then place 1 tablespoon of the apple mixture and 1 tablespoon of the caramel onto the pastry squares. Next, fold the pastry square over to form a triangle and take a fork to crimp the edges and create a small vent in the center of the pastry. And finally, place the pastries on a cookie sheet and bake for 20 to 30 minutes. Once the pastries’ edges are a golden brown remove and let cool. Stay tuned to Apothekare for more recipes, industry news and much more!